The UCBMA sponsors various local charity events such as the West Chester/Liberty Rotary’s BBQ Festival, Sharon Woods Holiday in Lights and the Annual Caring Like Karen Awards Luncheon. Each year, with grants and sponsorships, the UCBMA gives out more $30k to other worthy local organizations including Give Hope, Bicycle Recycle, Reach Out Lakota, Edge Teen Center, One Way Farm, Free Throw for Kids, Maureen L. Fritsch Cancer Fund, Shared Harvest, and Heroes’ Fund. The UCBMA Food Truck Rally benefits a new local non-profit. August 12, 2016 - Sojourner Recovery Services. UCBMA organizes the annual Union Centre Food Truck Rally and supports events such as the Shamrock Shuffle and the First Financial Concert Series. Funds are raised at these events that UCBMA then grants and does sponsorships out to area charitable organizations. 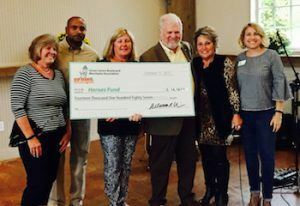 The Union Centre Boulevard Merchant Association offers grants to 501C3 charitable organizations that support a wide variety of projects within the Butler County area. Grants are awarded each month in the amounts of $250 – $1,000. If your organization is interested in applying for a grant, you can apply using the form below or click on the link to open and print the Grant Application. UCBMA also offers sponsorships to those in our community with 1,000 being the maximum amount. If you are interested in a sponsorship please email info@ucbma.com with your information.